Welcome back to all our campers. Please be aware due to weather conditions we cannot guarantee running water to cabins- Arapahoe bathhouse will be open for hot showers and toilets. Party @ Pavilion May 25th Music and dancing @ the pavilion 7pm to 11pm. Join the fun!! 7pm @ the pavilion, we'll bring the hot dogs and buns you bring a topping/side dish and drink. Pine Box Derby July 6th Meet @ pavilion 1pm for a pine box derby race. Winner gets a trophy. See store/office for details. Adults only, meet at pavilion at 8:30 for a hayride around the campground and sing some silly songs. Hunt for treat filled eggs with a flashlight. Meet @ pavilion 9:15pm. Kids 1-12 only, don’t forget a flashlight and a bag. The rec field offers a great view of the sky, on a clear night this is a spectacular sight. This is peak time, the meteor shower can be seen several days before and after. Pig Roast August 31st Meet @ pavilion 6:30. We'll supply the pig, you bring a dish to pass and what you're drinking. Meet @ pavilion at 8:30pm, bring some wine and cheese to share. Meet @ pavilion 7:30 to create a Halloween craft. Hot chocolate served. $5.00 per craft. Hunters welcome Bow through opening rifle weekend Stay in a rustic cabin in the woods for a better hunting experience, have an outdoor fire, it’s a lot nicer than a hotel room, (sorry there in no hunting on the property, but there are acres and acres of near-by state land. Closed for the season November 19th Happy holidays to all and hope to see you all again next year. 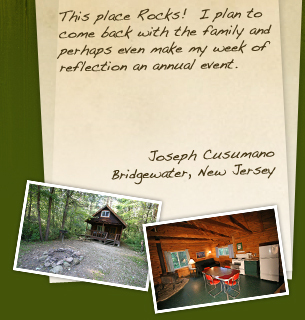 Make your plans early to enjoy our Western New York Camping, NY Log Cabins, or RV/tent sites early.